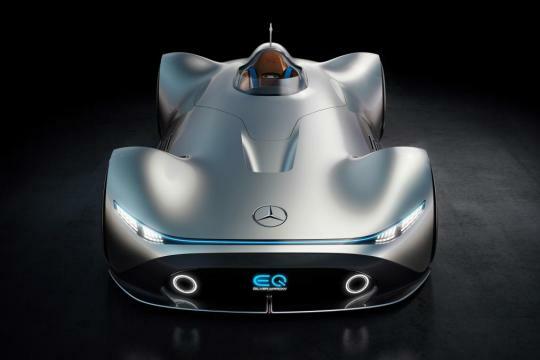 This is the Mercedes EQ Silver Arrow. 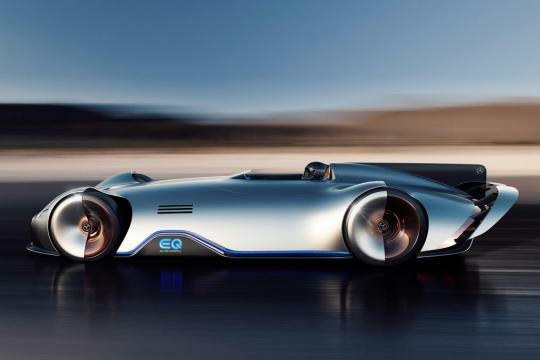 A futuristic take on the legendary W 125 Grand Prix racing car from 1937 that has been revealed at Pebble Beach Concours d’Elegance in California. 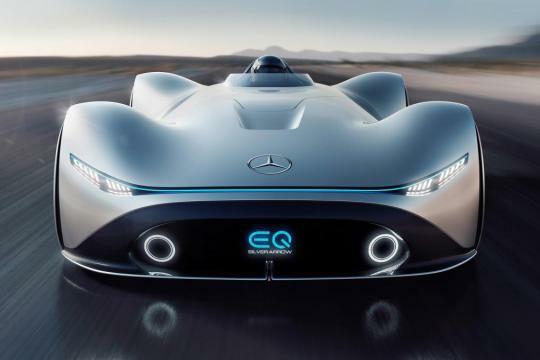 The concept is fully electric and intended to highlight Merc’s new all-electric EQ brand, however, it can also be taken as confirmation that high-performance EVs are something Mercedes will explore in the near future. More specifically, the concept is based on the W 125 Rekordwagen – a streamlined, experimental derivative of the racer. It set the world land speed record on a public road with a 269mph sprint in 1938, a feat only bettered in 2017 by Koenigsegg. The streamlined shape and profile of the concept, complete with a bubbled cockpit, huge bonnet and vertical tailfin, is lifted almost wholesale from the past.  However, there are plenty of modern and futuristic twists to the design. For instance the front end of the car is completed with a proper carbon-fibre splitter, while the nose is adorned with a full-width LED headlight strip. A nod to the Rekordwagen is found on the flanks of the vehicle – the kink in the side skirt to accommodate the EQ badge is where the exhausts were placed on the V12 engined streamliner. 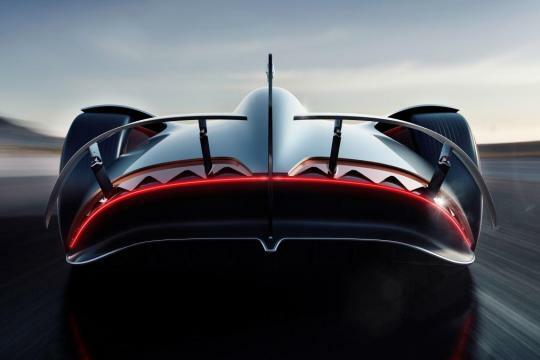 Around the back the aerodynamic work is completely contemporary, with a gaping rear end home to a huge diffuser and two extendible rear spoilers, which can act as an air brake. The concept rides on forged aluminium wheels 24-inches at the front and 26-inches at the rear featuring 168 spokes each, with the partial aerodynamic covers a modern twist on an old-school design. Mercedes hasn’t revealed how much the concept weighs, but its entire body is made from carbon fibre. The cockpit is home to a racing seat equipped with four-point harnesses and Merc’s Airscarf neck-level blower heaters. Compared to the exterior, plenty of traditional touches are found in here, such as the saddle brown leather on the seat and steering wheel and pinstriped wooden floor. In contrast, the driver views the road through a large panoramic screen supported by augmented reality technology that projects vital information straight onto the road. 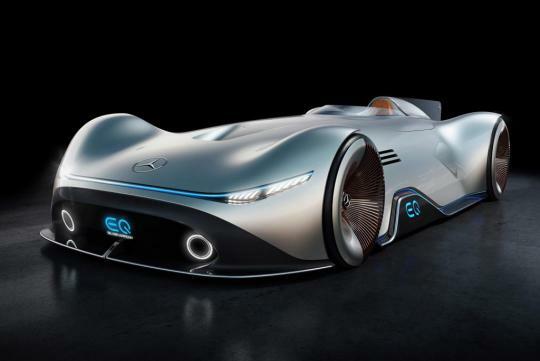 The tech supposedly supports a ‘virtual race’ mode too, which superimposes a current or classic Mercedes racing car onto the road, driving alongside the EQ Silver Arrow. A central touchscreen on the steering wheel can be used to toggle through the concept’s driving modes, and the driver can also choose to configure the car to sound like a current F1 car or a Mercedes-AMG V8 engined supercar. Powering the concept is a 740bhp electric powertrain supported by a thin 80kWh battery pack. Mercedes rates overall range at over 249 miles, but hasn’t issued any speculative performance figures. The EQ Silver Arrow concept arrives just ahead of the first all-electric EQ branded production Mercedes. To be revealed imminently and on sale early next year, the EQ C SUV kicks things off for Merc’s new electrified era, and will rival the Tesla Model X, Jaguar I-Pace, Audi e-tron and BMW iX3.